The FILPOST Endodontic Root Canal Post is the only prefabricated post retention system that can be customised to suit the restoration for root post and core build up. FILPOST can be bent and shortened to suit the canal without risk of fracture, enabling easy insertion of multiple posts into converging canals. for strong retention, created by retention grooves along the post and retention grooves formed within the canal surface by the FILPOST Universal Groover. without risk of fracture, enables two or more posts to be easily inserted into converging canals. avoids the risk of perforation and saves time as no need for drilling. minimises dentine removal during placement, preserves tooth structure, avoids weakening the tooth. along entire length, relieves hydrostatic pressure during placement. To provide retention of restorations by single or multiple root posts. 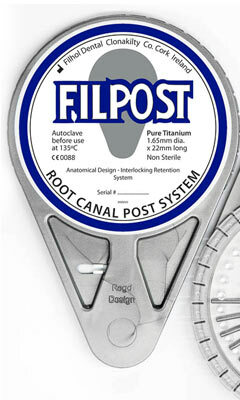 FILPOST is made by FILHOL DENTAL, a company specialising in the manufacture of high quality retention posts for over 40 years. Numerous FILPOSTs have been used worldwide. If you are a Dealer or Distributor, please feel free to contact us via our email form with any additional questions or reorders. If you are a dentist interested in either our Filpin or Filpost, please contact us via our email form for a distributor near you. If you are a patient interested in either our Filpin or Filpost please refer your dentist to us.